El Verano Taqueria has quesadillas this year. From the tasting event, I thought they would only be available in beef, but then I got there and there were pork, chicken and veggie quesadillas available too. I panicked and picked the carnitas, because in times of doubt I always choose the option that provides the most pork. It’s pretty good, though not spectacular. The cheese is smooth and melty, salty but not overwhelmingly sharp, and the pork is tender. 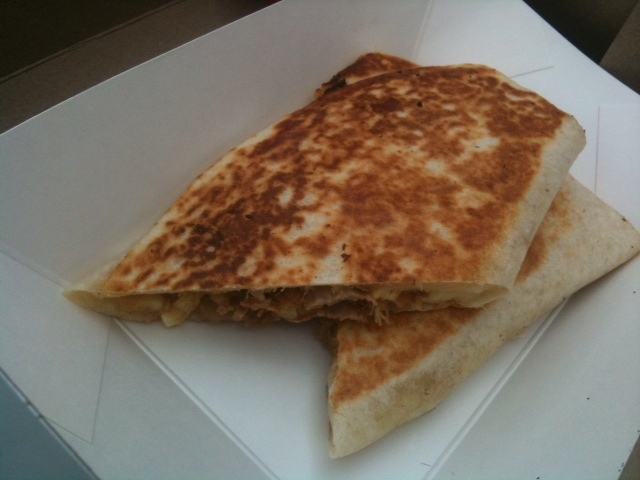 Since it’s just melted cheese and pork inside a pressed tortilla, though, the thing is pretty greasy. The strongest flavor comes from the lime crema, which is tasty on its own but strong enough in its tartness that it’s not clear it really goes with the quesadilla. Which is a little disappointing, because the regular carnitas tacos from El Verano Taqueria remain about my favorite thing available at Citi Field. It’s still a solid quesadilla, though.